After beginning to settle into my current location I began to track my food consumption after becoming disillusioned and disgusted by the food on offer in the caff. It began subtly but soon it became unbearable and frankly a little disturbing. My insides were in rebellion trying to combat what I put into myself. It became a way to occupy my time by focusing more on the things that keep me alive. Food is a fundamental aspect of our lives. The thing is it took this experience to confront myself about the kinds of things I consume. Seriously though there are a hundred and one different apps out there each purporting to be better than the last. In the many times that I spent looking up different foods that I consumed myfitnesspal came up often with the values for these items. The database by all means is not complete but as with all databases it takes everyone pitching in to add to it enhancing it. Independent agents acting alone for the benefit of the collective whole. I decided to get the app and buy a years worth of premium service. The geek in me needs to know the nitty gritty that this affords. The app ties in with the built in step counter. 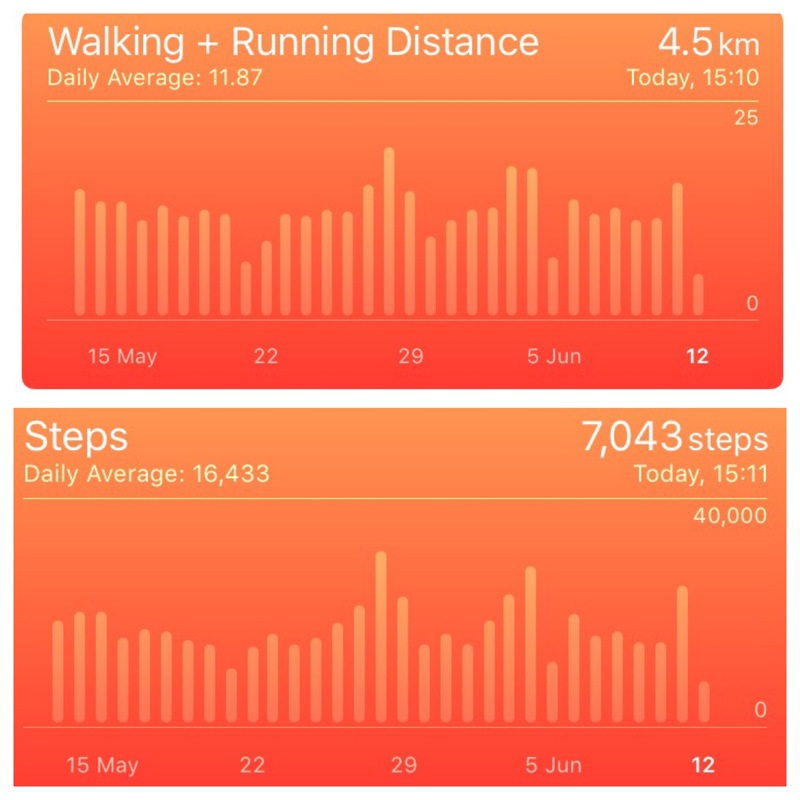 The accuracy of this type of activity tracker is dubious according to some but if it is consistent it allows at least some kind of data to track daily. I’m not going to buy a fitbit or any of the other thing-ama-bob because I’m trying to be frugal. Besides it seems to do a good enough of a job anyways. The damn phone never leaves my side and the app fits right inside there. It just gives me another excuse to tap at its screen in order to instruct it to do something. The barcode reader is especially helpful even if it has a hard time reading or deciphering certain barcodes. I never took any selfies with me standing in front of a mirror trying to decide whether or not I look fat or if there has been any change. The best indicator of my weightloss has been the way my clothes fit and the extra notch further along my belt. Just by eating fewer calories the weight has evaporated. When I first began I was eating more calorie intensive foods. That began to change as I noticed that I still felt hungry. What I needed to do was to eat less calorie intensive food in order to satisfy my hunger. It was also necessary to eliminate the foods that have a high caloric content. Say goodbye to all those pizzas that I loved to consume. I ate a whole one once in this period. I tried to be honest with my intake and tracking. Unflinching. Beer consumption, Sausage McMuffins, pizza, Fish ‘n’ Chips, as well as burgers etc were all consumed in the name of science and who am I kidding hunger too. I’ve shed five kilograms or about eleven pounds. The foods that I prepare for myself are coffee in the morning. One in the mug and the other in the thermos that I take with me. For breakfast I started with buying pre cut fresh fruit bowls but then progressed to making my own. I usually have at least 100g or so of yoghurt. For a snack that is sometimes needed in the morning before lunch I have some kind of a nut bar. At lunch I have a sandwich that I make the night before while cooking dinner. My dinner consists of some kind of a store bought dinner. I would like to cook more but the facilities here are lacking so I have refrained. I still wanted to have time to relax and do other activities. I have tried all kinds of different types of dinner meals. I have chosen meals that have a reduced amount of calories and can be viewed as the “healthy” options available at the super shops I frequent. For snacks and consumption I have certainly begun to eat more fruit. In order to continue my way forward I will have to incorporate a lot more veggies. There is a lack of nutrients that is not included in the information entered in the commercially purchased foods. The breakdown only goes as far as is necessary in the regulations. When looking at my calcium intake for example there is a distinct deficiency there even though I consume a latte pretty much every day. The commercially provided nutritional content lacks the value for this entry. This info of course differs between vendors. The other thing I noticed is that I was deficient in my Potassium intake. Potassium is involved in the conduction and propagation of neural signals. It is part of the Sodium-Potassium pump that helps to maintain the electrical potential between the outside and inside of a cell in preparation for an action potential. Most foods do not have this information there as it is not something that is required information. All food packaging in the UK is required to display the amount of calories, fat, carbohydrates, fibre, protein, and salt contained within. That’s a long list but there are so many more nutrients that are recommended that we eat daily. How will we know if we have enough if that content is not displayed? How many people care? Since my diet is a lot better than it was before I feel pretty good most of the time. My sleep schedule is fairly regular as are other aspects of my metabolism. For now, knock on wood, I feel pretty good. The little bodyweight routine I’ve developed helps develop the upper body as the lower part already takes many many steps as well as climbing many flights of stairs. Some stretching is incorporated into this routine and it usually lasts about twenty minutes at a time. Tracking like this and seeing the results offers encouragement. How this will develop through the next year will be interesting to see. For now it is useful to acknowledge the progress made. If I wasn’t living in these isolated conditions I doubt that I would have taken the time to examine my diet in this manner. At the beginning of this exercise I was weighing pretty much everything and entering the precise number. I began to notice that a few calories here and there represented by a few grams here and there don’t make that much difference. The big one would probably be mayonaise that I slather religiously on my sandwiches. I used to weigh the jar before and after applying mayo from inside of it. I just have a steady number now about a teaspoon on each slice. This is just a bit of self analysis. I have been thinking of writing about this for a while and today I found some time. It’s interesting to see how simple changes in lifestyle can have such an effect on a body even though it has been such a short time. Interestingly yesterday I wrote about my four year anniversary of landing in London. When I left Canada I weighed about 100 kilograms. This means that over the past four years I shed seventeen kilograms or about thirty-seven pounds or two point seven stone. I had started working out more first by simply doing a number of push ups in the morning slowly increasing reps. This continued after I bought myself a 12kg kettlebell. Each step was followed by a plateau. Bernie bought me a 20kg kettlebell for my birthday one year. That particular kettlebell is in Canada now. It has sentimental weight so I decided to ship it there when I moved back last year for a while. It’s awaiting for my return. What I’ve learned is that it is important to be consistent in your work outs. It takes time to drop weight. I certainly didn’t want to yo-yo but there have been fluctuations but the overall trend is downwards. Being up here in this part of the country it is easy to see where the obesity stats are coming from. It has been a motivating factor but the biggest one has been preparing for Ba(r)be. I would like to impress her physically so as to fulfill some sort of fantasy that is still undefined. More so than just impressing her it is also for myself, I am still of able body and making these improvements gives me some sort of pleasure and reassurance that I’m doing something right.